Day 2 EV Road Trip: Can we make the longest stretch? After a late lunch and an afternoon movie while charging the Leaf at Rabobank in Atascadero, we are about to depart and try to make 85 miles on a single charge. We will be cutting it really close, and will need to make a decision along the way about whether to stop for a quick charge as a safety net. I would rather try to power through, and get to Solvang before dark, but the Leaf will make that decision for us, as we keep our eye on the meter which estimates the number of miles we have left. There’s a big uphill stretch, which can reduce your range even as the downhill allows the car to regain some juice. How much it really loses on the uphill is difficult to gauge with the car’s built in meter because it estimates the miles remaining based in the current conditions. And, until you get used to that, it can give you a heavy dose of range anxiety. Perhaps the most disheartening moment of this drive is when my husband checks the Nissan Leaf app after hooking up the charger. It tells us how many hours the charge will take, and I am always hopeful for a short period. Here, the estimate was five hours. And, that is after spending four hours charging in King City earlier today. 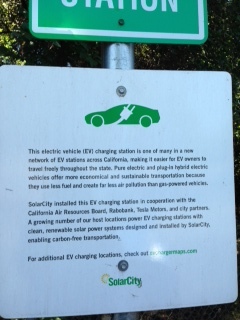 Luckily, there is just about all you need right across the street from the charger which was put here in cooperation with the bank,Tesla Motors, Solar City and the California Air Resources Board and the city. 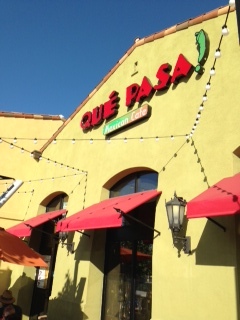 There’s Que Pasa, which has more than decent tacos, a Cold Stone Creamery and the state of the art movie theater. 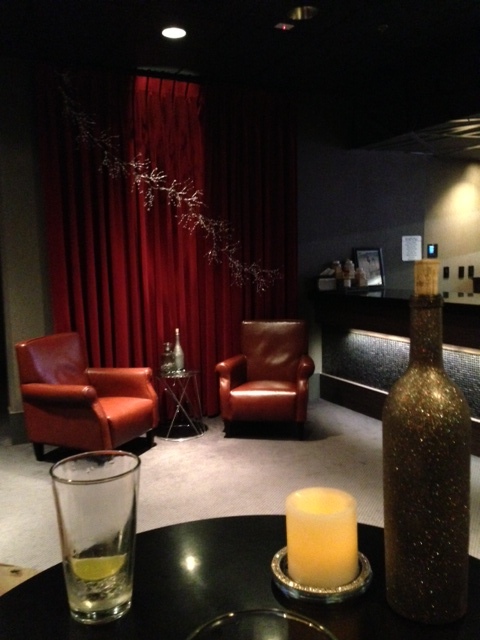 We opted for Star Trek in 3 D. The Galaxy Colony Square Theater also has a VIP lounge where you can have a drink and recharge your phone. There is no Wifi, however. With another 85 miles to go, we opted for club soda and sat and relaxed after the movie. The theater also has D-Box, which you can test out in the lobby. Basically your seat moves in synch with the movie action. Speaking of action, the charger just clicked off. We are all powered up and ready to go! Hope you made it. Incidentally, you maximize your range going between 35-40 mph*. Interestingly and a bit counter-intuitively, you also minimize your total time (driving+charging) at that speed, assuming you stop somewhere in the middle to charge (Level II or less). Perhaps you can use this on your return trip. * I noticed the speedometer at 56 in your tout. This is great advice! Thanks.